I’m back again! And this time, it’s going to be on a regular basis…I promise! There’s so much I want to share about easy budget-friendly wedding planning, Ramadan decor ideas and of course home decor and lifestyle ideas for condos. 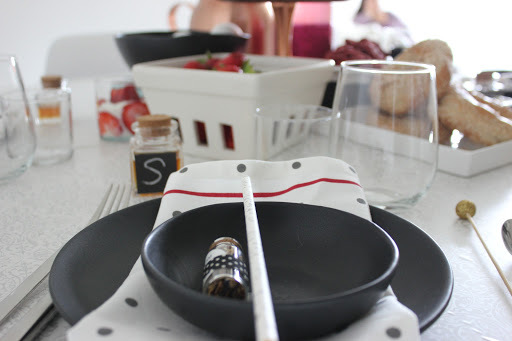 Today though, I want to share a fun idea for Sunday brunching! When I think of Sundays, I think of brunch. It’s one of my favourite things about the summer and with a new place of my own, it’s nice to be able to host one at home for significantly less. As everyone knows, I love setting up pretty parties and can’t ever leave out a good tablescape or paper goodies! This past Sunday, I styled a brunch menu and tablescape that’s ideal for the summer and for anyone that’s always on the go. 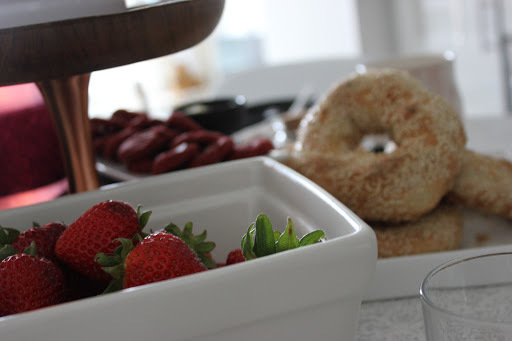 A lot of the food items are easy to make or are make-ahead brunch ideas that are easy and quick to execute. 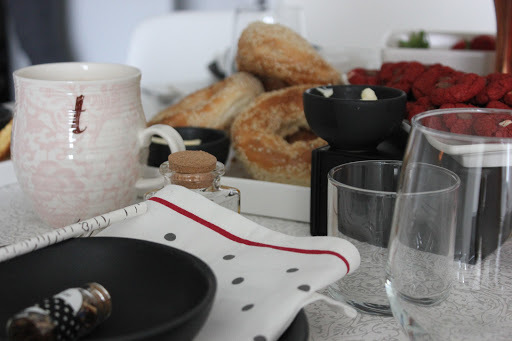 There are also some tips on quick tablescapes that still look fab! Firstly, you’ll want to create your guest list and send out invitations. Another thing everyone has to know is that I love paper products and actual invitation cards. If you don’t know, now you do. But seriously, that’s obvious! Anyway, it’s safe to say that although I love real mail to get cards to my guests, it’s not always ideal. That’s especially of note for when I make a last minute plan or think I’ll get everything mailed out and still end up having a few straggler cards in my purse and just end up texting my friends instead! And that my friends, it’s where my fave online invitation delivery/evites come into play! Of all types of online invitations Paperless Post is my go-to! I’ve used it for several events including my cookie swaps, friends wedding showers and even birthdays. When they asked me to write this blog post, I was so excited because it really is a product I use all the time! Paperless Post is the ideal place to get unique invitations that mimic the paper world without the worry of mail delivery. It really does add to the whole experience of the event and gives the guests an idea of what they are in for! Another great thing about their service is that you can design each card to reflect exactly what you want and there is even an option to get a print version if you really want to! They’ve even partnered with great brands that I love like Kate Spade and Sugar Paper LA to bring really great designs to the digital world. 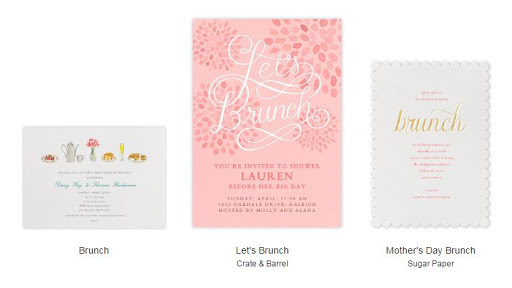 Here’s a screen shot of pre-designed brunch cards. I love the middle one! You can check the invitations out here. Let me know which your favourite designs are in the comments below. 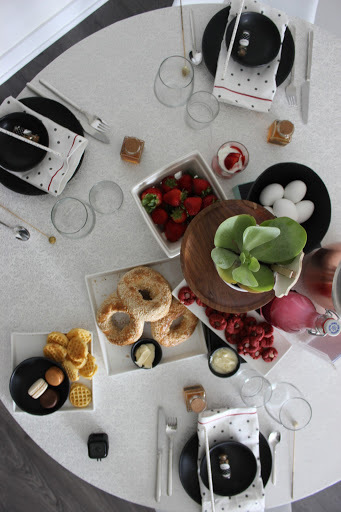 Are you hosting a brunch anytime soon? I would love to see your tablescape and decor! Just tag your posts on Instagram with #eatlovecraft. You can find me here. If you’re posting to Facebook, post it to my page here. Give the page a like so you can get updates to new blog posts easily. 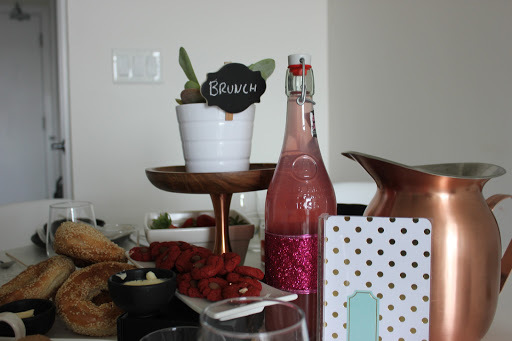 I have shared the Menu & DIY Brunch decor ideas after the photos, before the jump. 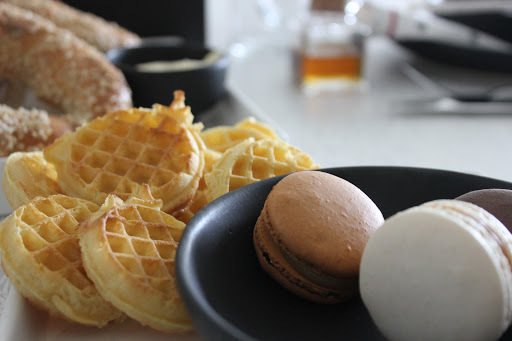 Mini Eggo Waffles – just pop them in a toaster, separate and plate. These are cute because they are small and no one will judge that they’re ready-made. I served this with mini bottles of maple syrup at each place setting. Mini Cookies – another ready-made item, but they can also be made ahead and frozen to serve later. I had these left over from my wedding and kept them in the freezer. 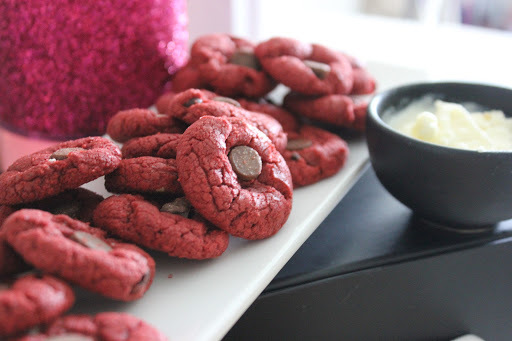 I got these delicious red velvet ones from Golden Crumb Biscuit – a local toronto-based brand. Bagels – this is an easy one. 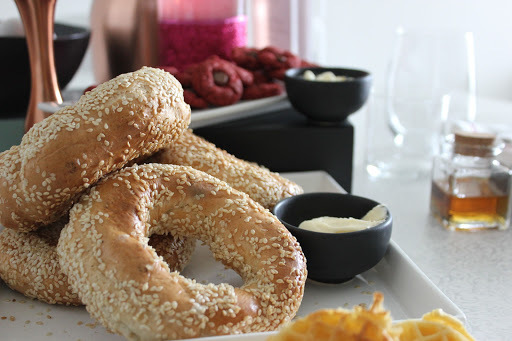 I got a batch of fresh Montreal-style bagels during my trip on the long weekend, but I would go for a local, freshly made batch over a store-brought package anytime! Boiled Eggs – these are an wasy way for people to get in some protein without you slaving away over the stove-top while everyone else is having a blast. Boiled eggs can be made ahead of time and just kept in the fridge and pulled out the next morning. Easy Peasy. Macarons – of course, how could you not! So many great places to get some of the best Macarons in Toronto – Nadege (my fave! ), Butter Avenue, Bobbette and Belle, Delysees… I could go on! Fresh Fruit – another easy one. Just buy, wash and plate! I like serving berries, grapes or anything thats easy to eat without having to cut. 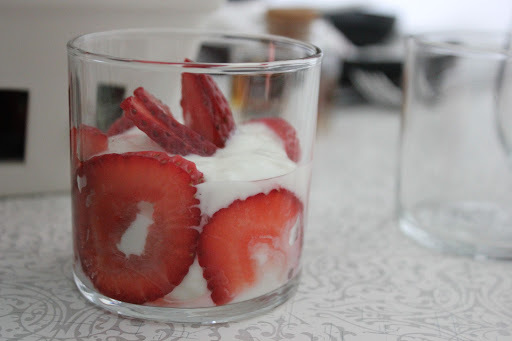 Yogurt – I didn’t have any granola on hand but I had strawberrries! I made some thin slices of one and made a small yogurt cup for anyone who wanted that instead. You can make mini parfaits as well. It’s an easy thing to do that looks great in a glass cup. This glass cup was actually another wedding leftover. This is actually a candle votive that’s the perfect size for a small drinking cup. I had so many that they are scattered all over the house for different uses. 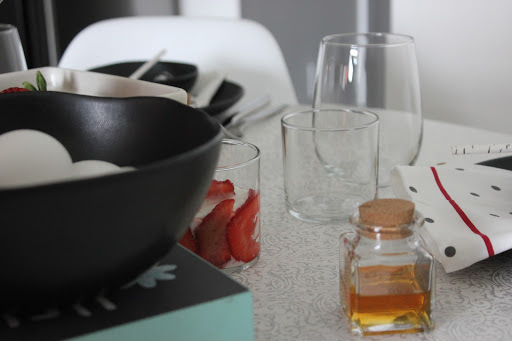 To Drink – I love having glass bottles filled with pre-bought juice. It makes it look really classy but costs really little. This time, I just bought some pre-made pink lemonade and put in into a glass bottle and dressed the bottle up with some ribbon to get a little fancy. I have a Nespresso machine and a selection of teas that guests could help themselves to. I also had ice cold water in my new copper pitcher. Side note: I am currently obsessed with copper – you will soon learn/see! Finally, I had mini bowls with whipped cream and butter on the sides so people could use them on whatever they liked. It’s a nice way to displace without bringing the big bottles onto the tables. 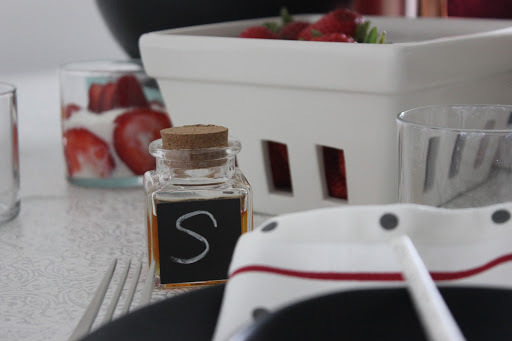 Place setting – I used small chalkboard bottles with maple syrup inside to mark everyone’s seat. This allowed me to not bring the big maple syrup bottle to the table and yet still have it there. Really loved that each setting had their own individual syrup to use in a cute little corked bottle! Centerpiece – my go-to as you know is a potted plant and a cake stand. It’s so easy and hassle-free. I added a small chalkboard tag to customize it a little bit and match it with the other hints of black and white on the table. 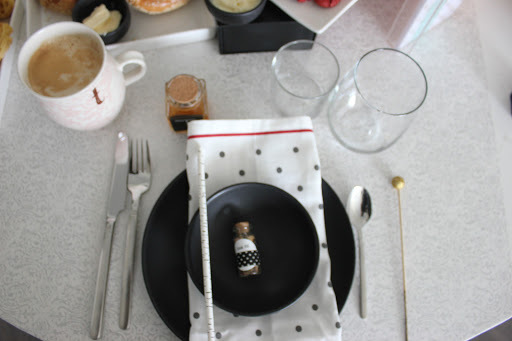 Mini-giveaway – I have always liked to give guests something to take home with them. Again, I had some left over giveaways from my henna party, so all I did to change it up a little is add a bit of black and white polka dot ribbon to the bottles of pink-lemonade tea and put it into each bowl. Paper things! I had a cute paper straw for each guest to go along with the black and white, and the plant and woods since it was a woodgrain straw. I had these left over from the wedding as well! I also added a small wooden swizzle stick for anyone drinking coffee. I placed a cute small gold ball that I got in a vase-filled package during the holidays. They’ve been used in so many of my events and are the perfect way to dress up plain things like a wooden stick! 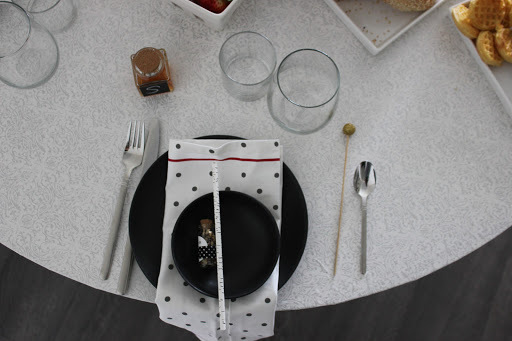 Napkins – I picked these up at IKEA and love them! They worked perfectly for this theme. They have floral prints on each corner but I folded those in to only show the middle portion. Note: This post was in collaboration with Paperless post. All opinions are all my own. Well, the wedding is officially a week away and I couldn’t be more excited (and stressed/nervous and so on! It’s been a great experience going through this process and maybe one day wedding planning will excite me again, but right now I’m a teeeensy but exhausted and really just want to move into my new place and start working my decorating project. Yes, I will always need to be on the go and busy to be me! The one thing that I have learnt through this process is to always be prepared in advance. If there are things that can be done before, just get them out of the way. Why wait until the 11th hour? You’ll be plenty busy and have way too many unexpected things pop up out of nowhere, things you just didn’t expect! A little over a month ago, a family member sprained their ankle and while it’s still healing, AH it’s getting much better. I also had lots to work back and forth with my caterer, decorator, planner, venue and everyone in my family – it’s been pretty crazy! And with all of that, I was simultaneously moving into a new apartment, setting it up to be ready for next weekend and getting a bunch of paperwork setup for that. So to say I was busy, is just hitting the surface. A big thing that I always do is prep in advance for my week (since work isn’t really optional!) is to meal plan. When it comes to crazy busy times it’s harder to want to spend time making food when you can just buy some. With trying to eat healthy and work out all during wedding season, you’ve got to really plan everything out. That’s where these amazing chicken pies come in! Honestly when I was asked to give them a try, I opened my arms with a giant sigh of relief! 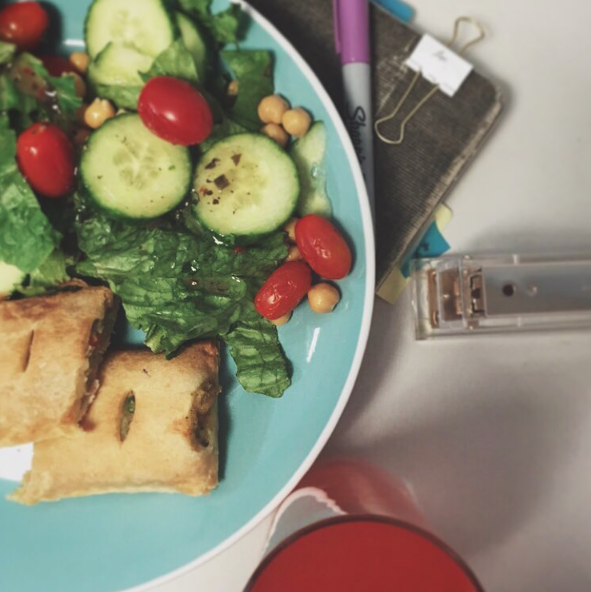 Getting a filling meal in a one minute microwave pack was a lifesaver in these last few weeks. I kept a few packs at the office and had some at my new apartment and obviously a bunch at home. The best part was that everyone loves them (Including bridesmaids who’ve been dragged to your house for more DIY projects….). With healthy options and white meat, it really was the best part of this crazy time. Eating fast, halal, healthy food isn’t always possible and Mortimer’s Halal Kitchen made it really easy to do everything I needed to without worrying about food. 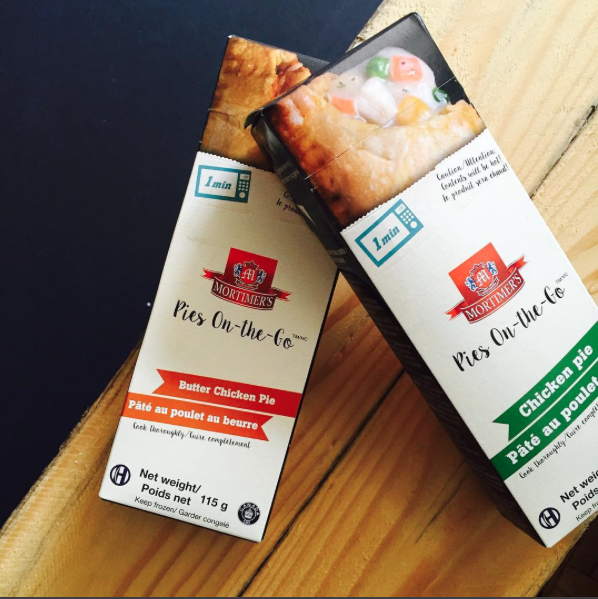 You can find these delicious Halal-on-the-Go pies at your local FreshCo, Sobeys and Longos in the meat department. If they don’t carry them, ask them to order them in! Don’t forget to like their Facebook page to keep up with new products and learn more about the current ones! Want to try some on me? Just follow the instructions on my Instagram post to enter to win a $50 grocery card from Sobeys.